Texwipe has been the leader in contamination control products for over 40 years and testing our products to the strictest standards is paramount. We employ test procedures (Basis Weight, Absorbency and Non-Volatile Extractables) from standards organizations such as the American Society for Testing Materials (ASTM), the Association of the Nonwoven Fabrics Industry (INDA) and the Institute for Environmental Sciences and Technology (IEST). We innovated some testing (Particle testing using Scanning Electron Microscopy (SEM) Enumeration, Ion Testing with Ion Chromatography and the measurement of fabric surface resistivity) and developed new accurate and reproducible methods. 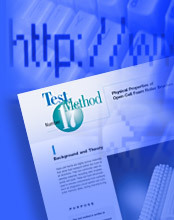 We have been diligent in publishing this information in open literature and in making our test methods available. Select any of our product families in the table below for more information. Matter Extractable from Wipers and Other Materials. To determine the mass of material extractable from a wiper (or other item) using a given solvent. 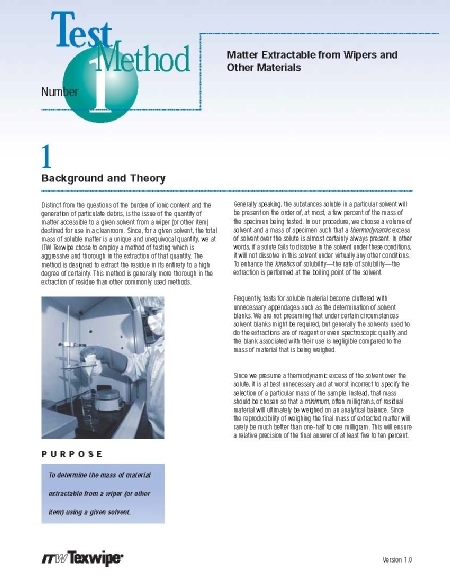 Procedure for Determining the Nonvolatile Residue (NVR) Extractable from Swabs in a Given Solvent. 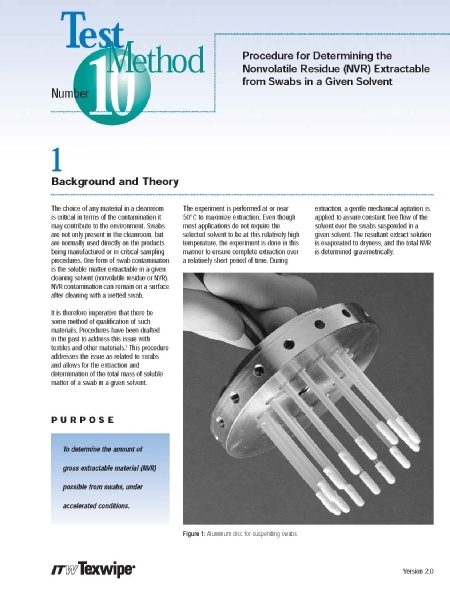 One form of swab contamination is the soluble matter extractable in a given cleaning solvent (nonvolatile residue or NVR). NVR contamination can remain on a surface after cleaning with a wetted swab. Swabs can transport charge and generate static charge due to contact with other surfaces. Such charges can subsequently lead to electrostatic discharge (ESD) that can damage products or equipment. 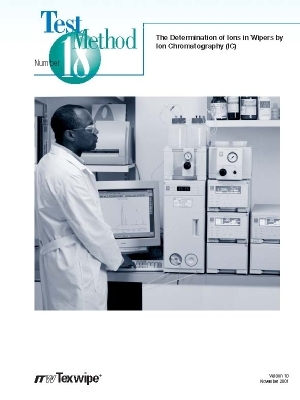 A rapid analytical technique for qualitative and quantitative determination of a wide variety of ionic species. 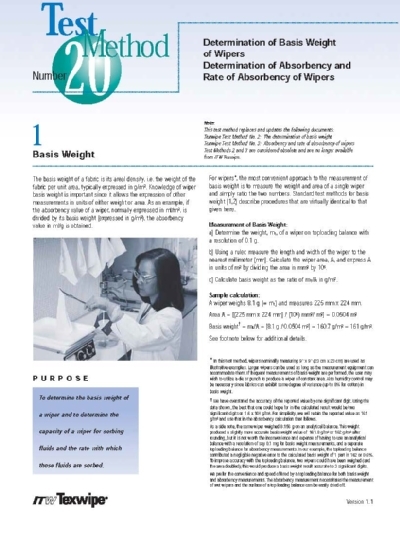 Knowledge of wiper basis weight is important since it allows the expression of other measurements in units of either weight or area. 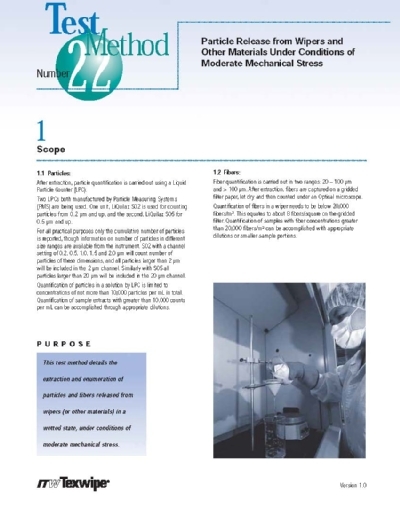 This test method details the extraction and enumeration of particles and fibers released from wipers (or other materials) in a wetted state, under conditions of moderate mechanical stress.